Roz Greenwood & Marg Phillips. Bruce Simons, Principal, The Hamilton & Alexandra College. 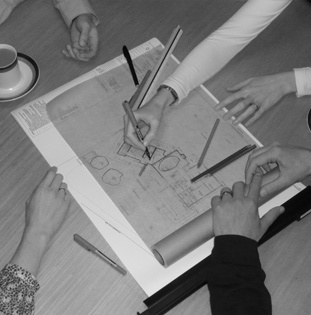 "Cooper Scaife Architects were very professional at every stage of our project. It is a pleasure to deal with people who are so good at what they do." "The design that Cooper Scaife Architects created for our family home has made so much difference to our daily lives. Every morning when I wake up I‘m just so happy to be living here. We will spend the rest of our lives in this house. I can’t recommend Cooper Scaife highly enough." Darren Stanbury, Principal, Sacred Heart Primary School, Casterton. "Cooper Scaife Architects worked on the extension of our house in Tarrington. Our brief was to add on to an old federation house - a living, dining, kitchen - and to take advantage of the wonderful views of the Grampians. From the outside it is hard to see where the new begins - it looks like the extension was always there. The space itself has double glazed windows all along the north side with a verandah. This keeps the temperature even in all weathers. It is a great space to be in and we are delighted with it."